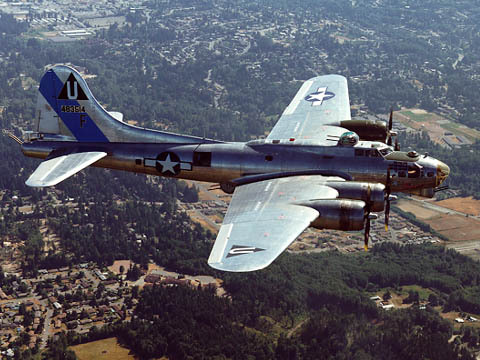 The Boeing B-17 Flying Fortress, affectionately nicknamed "The Queen of the Skies,"played many roles in World War II. In both the European and Pacific theaters, the B-17 served for photographic reconnaissance, antisubmarine warfare, and bomb delivery. The P-51D Mustang escorted B-17s on their bombing runs. One of the famous B-17s, The Memphis Belle, with an intensified forward defense firepower of flexible machine guns, was the first bomber to complete 25 European missions and return.